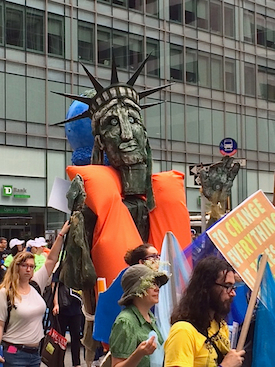 Lady Liberty on 42nd Street models what could be New York's trendiest fashion if sea levels rise. Photo by Hal J. Cohen. March organizers estimate approximately 310,000 people marched through midtown Manhattan -- including UN Secretary-General Ban Ki-moon, British primatologist Jane Goodall and actor Leonardo DiCaprio -- causing the march to last at least five hours. Both the Climate March -- the largest in history -- and Monday’s direct actions preceded the UN Climate Summit Tuesday, which was the first high-level climate summit since Copenhagen almost five years ago. The one-day summit was attended by 120 world leaders who made non-binding agreements to slow global warming. A larger 200-nation climate summit is scheduled for Paris in 2015. "In 2,500 marches from Paris to Bogota, we've blown past expected numbers. Climate change is not a green issue anymore, it's an everybody issue."